Welcome back to the first progress report of the year. Quite a large number of fixes and improvements have been made already, and as you can see below from the big compatibility bump we are starting the year off strong. kd-11 has made some major improvements that increase stability and functionality including increasing performance with Ryzen and implementing a Native UI to RPCS3. While Nekotekina has continued to review people’s changes, making sure everything was in a good enough state to be merged, he continued to work on the core of RPCS3. Megamouse has also made many improvements to the way RPCS3 handles input allowing a bunch of games to progress further and he also fixed other issues with the UI. On the compatibility database statistics, over a hundred games moved out of the Nothing, Loadable, and Intro sections and in to Ingame or Playable. In addition, the Nothing section has now fallen below 2% of tested games, and hopefully Loadable will follow next. 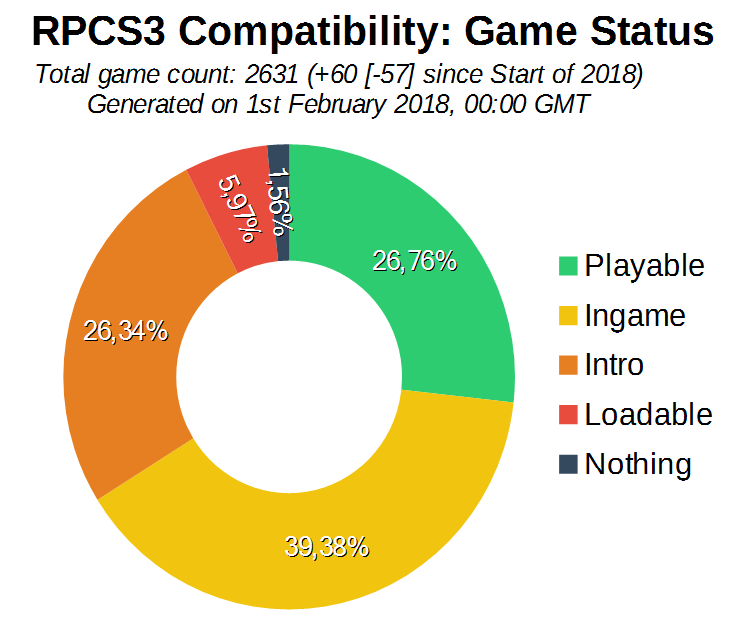 This means RPCS3 is on the right track to ensure accuracy and compatibility with the largest number of titles possible. On GitHub statistics, 7,454 lines of code were added and 2,160 were removed by a total of 14 authors.